The post was created in partnership with Glutino. 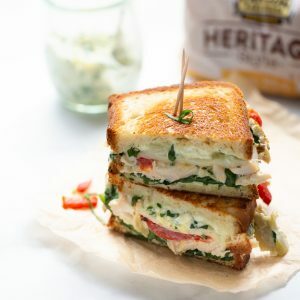 I love the flavors of spinach artichoke dip, but I can’t eat as much dairy as the traditional version has on a daily basis. 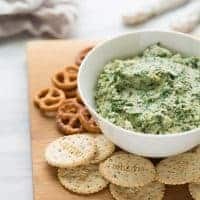 This Clean-Eating Spinach Artichoke Dip is a healthy version of my favorite with all the same delicious flavors. I love having this in my fridge for a healthy, satisfying afternoon snack with some of my favorite gluten-free crackers. I also like it for a light lunch with crackers, cut up veggies, and sliced turkey. It is so good! 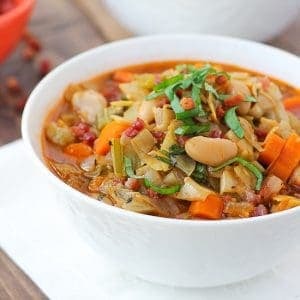 One of my very favorite snacks used to be crackers and cheese, but when you’re avoiding gluten and dairy that combination isn’t very accessible. I think the salty flavor of the marinated artichokes is what makes it so satisfying. My 1-year-old actually loves this dip as well – I think for that very reason. 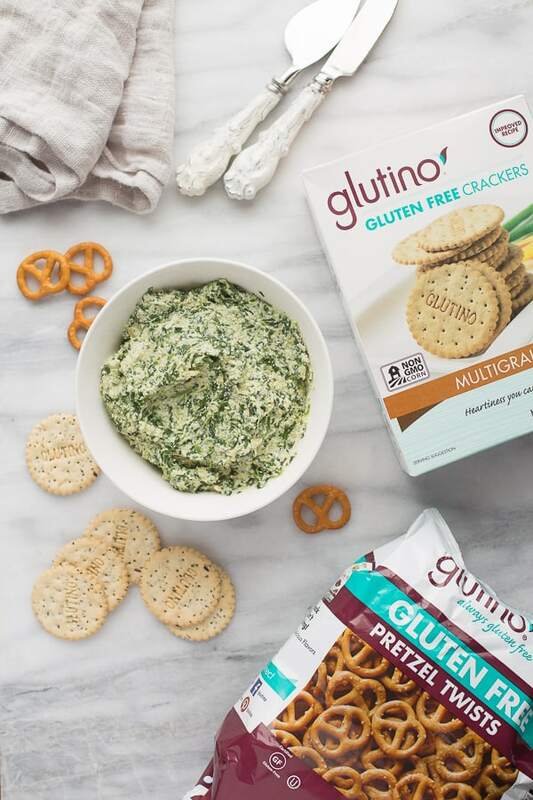 Glutino crackers have a nice mild flavor and are perfect with dips, especially this one. I also love, love their pretzels. I use them in so many recipes like this Gluten-Free Pretzel Crusted Chicken and this popular Vegan Chocolate Pudding Pretzel Pie. They taste just like regular pretzels! 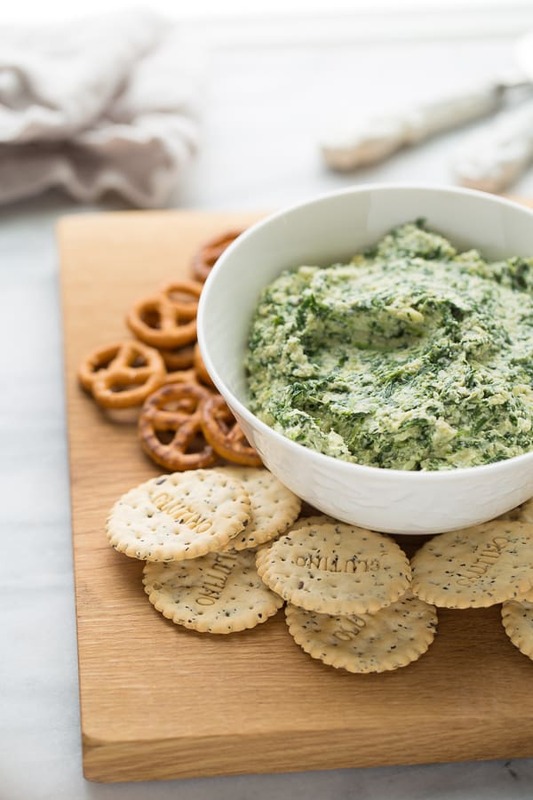 I think this dip works best when I thaw the spinach in the microwave and squeeze out as much excess moisture as possible. You can also defrost in the refrigerator overnight, just be sure it’s totally defrosted before squeezing out the liquid. My favorite marinated artichoke hearts are the jarred kind from Costco. Soaking the cashews is really important so don’t skip this step! You can soak them at room temperature for 6 hours or overnight in the refrigerator. 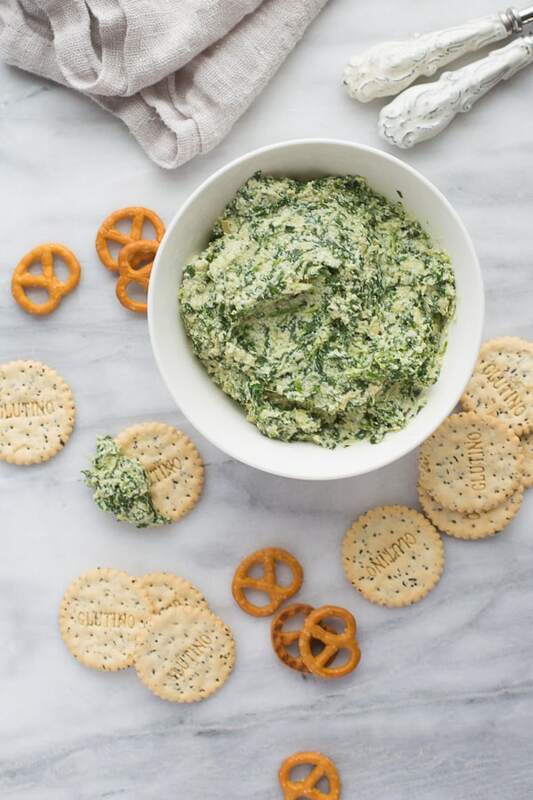 This dip makes a delicious, healthy snack served with Glutino crackers and some carrots/celery! In the bowl of a small food processor (be sure it is a smaller one so everything blends up) place the cashews, mayonnaise, lemon juice, artichoke marinade, onion powder, garlic powder and salt. Blend until smooth, about 2 minutes, scraping down the sides as needed. Add the marinated artichoke hearts and spinach. Pulse to combine, leaving some flecks of spinach and not totally pureeing. Serve with crackers and enjoy! This dip keeps for up to 5 days in the refrigerator. Can cashew butter be used as a substitute for the soaked cashews? Have you tried with Nutritional Yeast to give it a cheesy flavor? What brand of mayo do you use? I can’t find any without soybean oil or sugar added. I like Sir Kensington! It has clean ingredients. My granddaughter has to eat gluten free. I would love to have some more ideas from you. Does this need to be served cold? If it is possible to heat this, how would you recommend doing that? Thank you! Looks tasty!! Such a healthy snack that satisfies my salty cravings.